If you’ve spent any time in Chiang Mai, your visit was undoubtedly memorable. 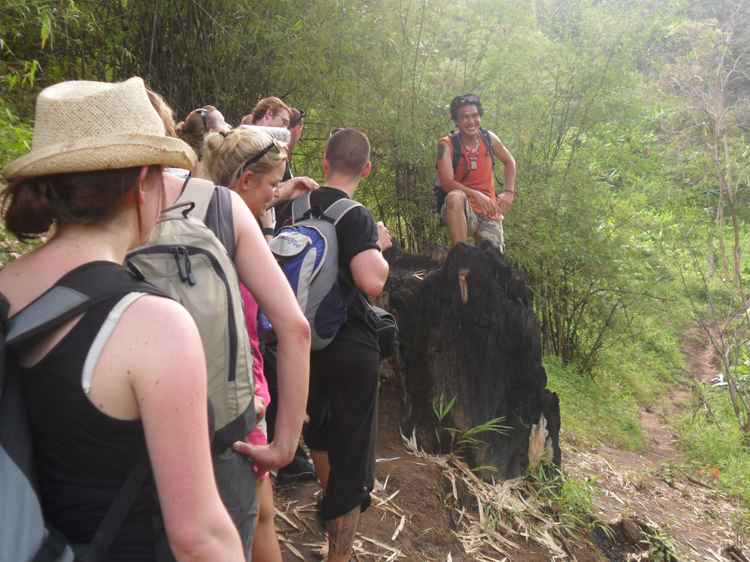 Though the city has an incredible amount of things to see and do, trekking is the number one thing that draws visitors. 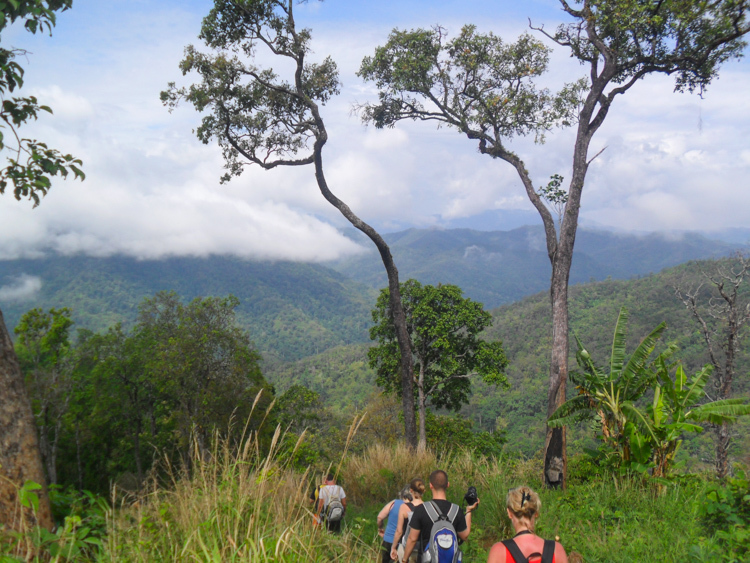 You’ll find tour companies on almost every corner who offer multi-day trekking tours into the mountains of northern Thailand for a chance to experience authentic hill tribe cultures. There are some things I wish I had done differently, and also some great things I came away with that I wasn’t expecting. It was the first week of May, marking the abrupt end of the hot season and the beginning of the rainy season. Near my hotel was a tour company with whom I had booked a 2-day trekking adventure in an attempt to immerse myself in the culture of the region. The next morning I was picked up bright and early (along with about 8 other trekkers) and our adventure had officially begun. After stopping at a local farmers market for snacks and water (why, oh why didn’t I buy a bottle of water?!) 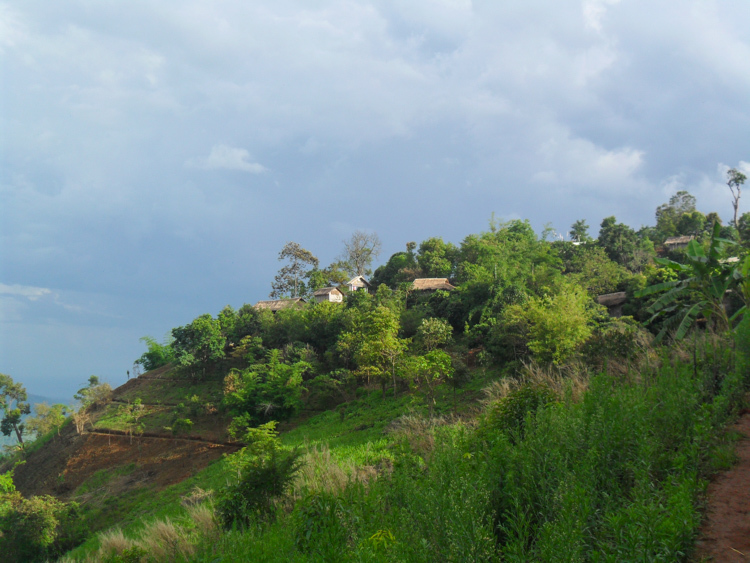 we ventured to an elephant camp in the mountains. We were given a chance to ride the elephants, three people to an elephant. In all it’s Jungle Book glory, this was the moment I had dreamed about and one of the main reasons I had come to Chiang Mai. Sadly though, it was a rude awakening when I saw the mahout guide using a sharp metal prong to jab the elephant in front of us. Every mahout had one, and they were using them. I’ll spare you the photos but this awful sight made me understand why we shouldn’t support such activities. I later learned of the Elephant Nature Park which rescues elephants; instead of keeping chains around their neck and feet, they only put a jingle bell around their neck so they can be located at meal and bath times. They are well-loved and cared for in their retirement and I highly recommend you visit, too. 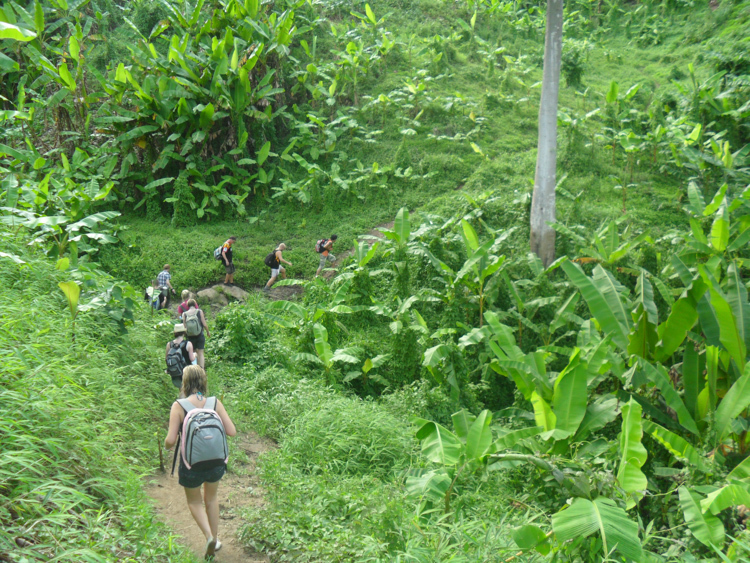 As we set off into the jungle on our trek, the scenery was lush and green with humidity more intense than I could have imagined. The hike was, in all honesty, very difficult for me. Some sections were simple but much of it was steep and slippery. The key words here are JUNGLE and HILL. I should have been in better shape or at very least done some stretching; I am glad the group often stopped for short breaks. 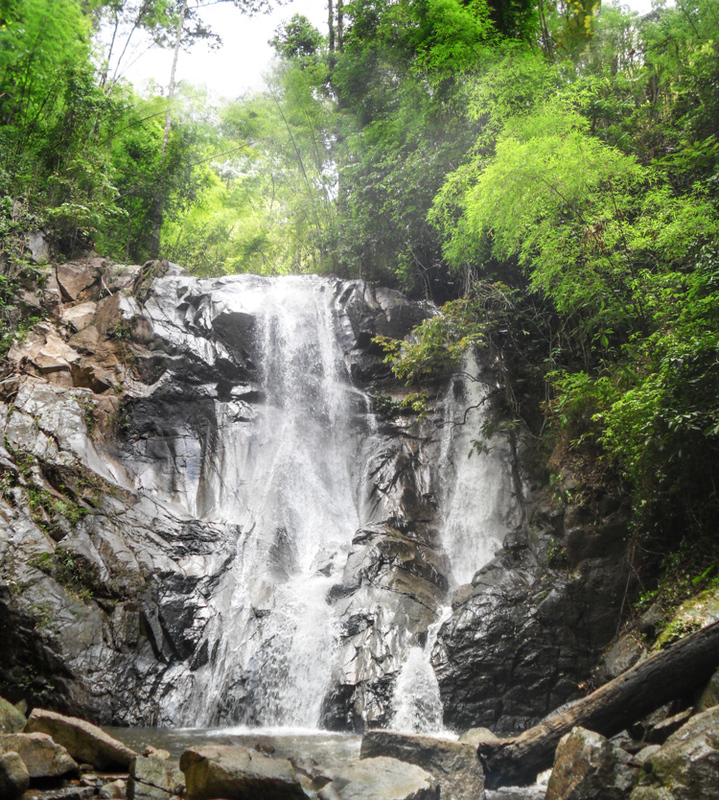 As if a gift from the heavens, we were thrilled when coming upon a beautiful waterfall where many took the opportunity for a refreshing swim. Our guide, clad in flip flops and sunglasses, was a total comedian and made us laugh a lot. He is pictured at the bottom of this post as he joked with us along the trek. An expert in the area, he stopped along the way to point out unique foliage, bugs and even WILD ELEPHANTS! 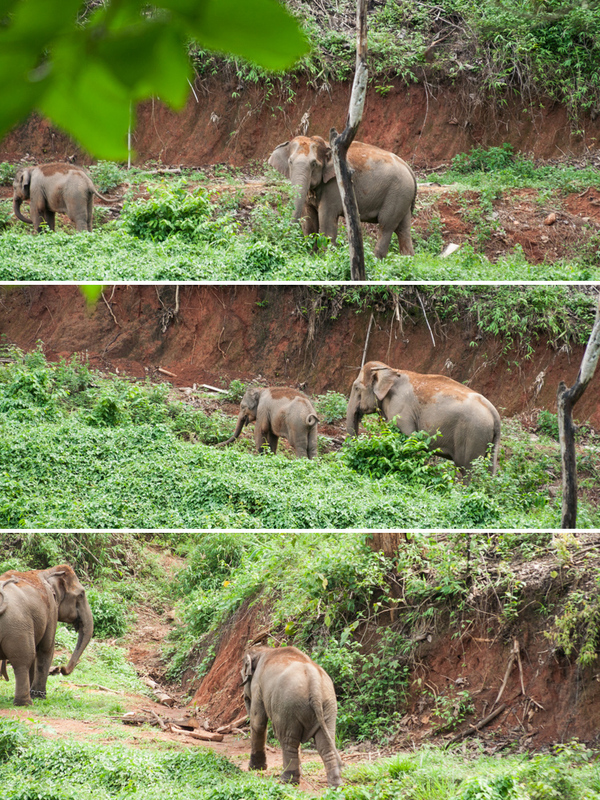 Every one of us were speechless as we watched a mother and baby elephant nibble on greens and then continue on their journey (shown below). 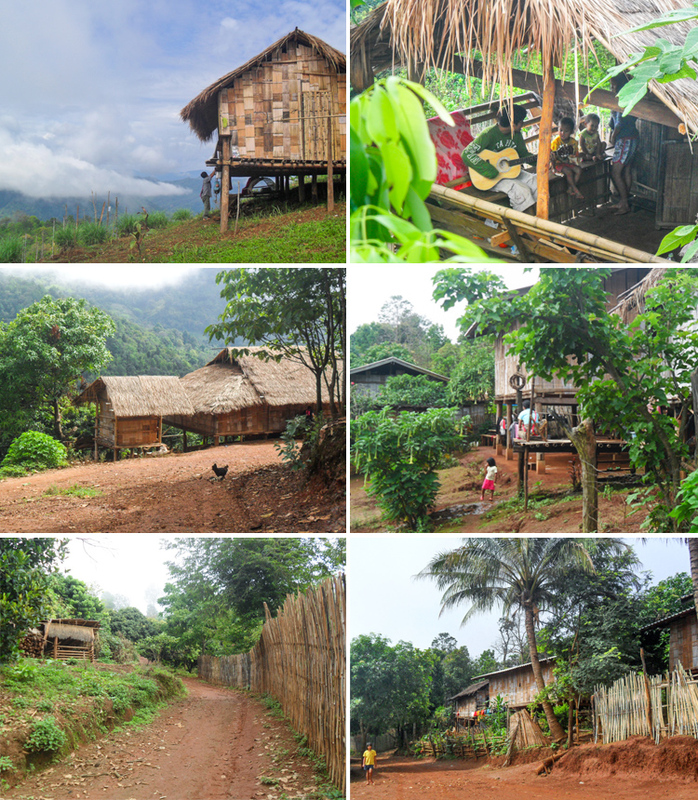 We arrived at the Lahu hill tribe village before sundown and locals greeted us while ushering us directly into their hut-style showers. I suggest that you look at traveler photos on TripAdvisor so you have an idea of what to expect. The village is one of many hill tribes that migrated to Thailand over the last hundred years from the Asian interior and have largely preserved their traditional ways of life. Every tribe has their own language, customs and beliefs, but they all prefer living in high elevations and they wear colorful traditional attire each day. Elder Lahu women showed us where we would be sleeping and we each claimed our mats and bedding. The heavy woven blankets I thought would be uncomfortable but my concerns washed away when I curled up that night in my warm bed and fell asleep almost instantly. The ladies gave us Thai massages, which I was grateful for after the uphill trek. I pointed to my legs, and she totally understood. Part of me wanted to laugh though—surely this wasn’t traditional hill tribe culture, but it most definitely is their main source of income and they couldn’t have been happier to welcome us and make us comfortable. The Lahu villagers survive on their crops of rice, corn and other vegetables. The family-style dinner they had prepared for us was very special. Hosted by an elder man of the village, we sat on the hut floor around a spread of fragrant curries, vegetables, and even giant bowl of fresh pineapple. Yumm! We ate by candle light as our host handed out cold beers. He is wise, he knows there is no quicker way to make new friends. After dinner was probably my favorite part, when everyone sat around a campfire on our deck. Villagers played music—drums on a large gourd and also guitar— as we sang songs and watched the stars. Off in the distance there was a thunderstorm that lit up the entire sky; it was quite a show to see from our high elevation. I talked with the guitar playing teenager about the music he liked. He had no means of listening to music other than his guitar, I don’t think the village even had electricity. I figured he would absolutely flip when I offered to loan him my iPod with thousands of songs. I showed him that he could listen to his favorite music by Bob Marley, Oasis and U2 but he was confused why I thought he needed this thing. He didn’t want it, he didn’t even want to try listening to it. He said he was perfectly happy with his guitar. The next morning I awoke to a quiet village dense with morning fog. Oh wait, I forgot that I had actually awoken by the crows of a rooster. Such is hill tribe life. With the tour group as one, we set off down the mountain where we were picked up and taken on a river raft adventure. It was nothing like river rafting as I knew it; this was river rafting Tom Sawyer style, on a bamboo raft. It freaky but certainly adventurous. On the drive home, heavy rains whaled down on us and some roads were flooding. Maybe it was just me, but despite being drenched head to toe I knew I had conquered something and no amount of rain could make me flinch. Exhausted but happy to be back in the city, I was really proud of myself for trying something adventurous. What a lovely and welcoming culture they shared with us, and I hope you get a chance to experience it too. Thank you Chiang Mai for an experience I’ll never forget! As always, thank you for reading.